Mandriva Linux Chronicles: Another Surprise: Mageia 5 RC is available! A blog to compile what I have learned (and what I am learning) about Mandriva (and GNU/Linux in general) since 2009, when I migrated. 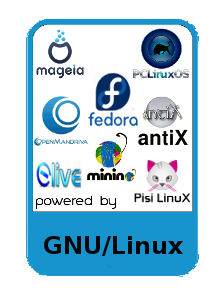 Current distros I'm using: OpenMandriva Lx 3.1 /3.0 Mageia 6, PCLinuxOS 2017.03, Fedora Workstation 27 (KDE spin), PicarOS, Pisi Linux 1, Elive beta, and AntiX 13. Another Surprise: Mageia 5 RC is available! I don't know why DistroWatch seemed to have missed it, but Mageia 5 RC is available for download. Great, I was becoming nervous because of the long silence since Beta 3, released on Feb 14. This is another surprise that should go under the "GOOD" list I wrote yesterday. UPDATE: I installed Mageia 5 RC. To read about it, click here. It's weird that the announcement is absent @ DW. Linux sur mon ordinateur. Je l'aime bien ! Mageia, PCLinuxOS, AntiX, PicarOS (MiniNO) Pisi, OpenMandriva, Mint. Kubuntu, Fedora, Fusion, Elive, Kongoni, OpenSuse, Puppy, TinyME, ZenWalk, MCNLive, Salix, Chakra, Tuquito, Sabayon, Vinux, Ubuntu.